Over the last few months, Haig Barrett had the honor of sponsoring Stiletto Gal Speaker Series. The series is part of the ongoing efforts of Haig Barrett’s new division, The W Factor, to create more awareness around women and what they care most about. This past April, we hosted the last event of the series featuring Erica Spiegelman, an Addiction Specialist, Counselor, Author, and Speaker, and Brittany Castro, Founder & CEO of Financially Wise Women. The event not only provided insights and resources for the audience but also provided a great way to broaden the sphere of influence, to expand on discussions about various interests in today’s community, and most importantly, to bring women together to collaborate and share. 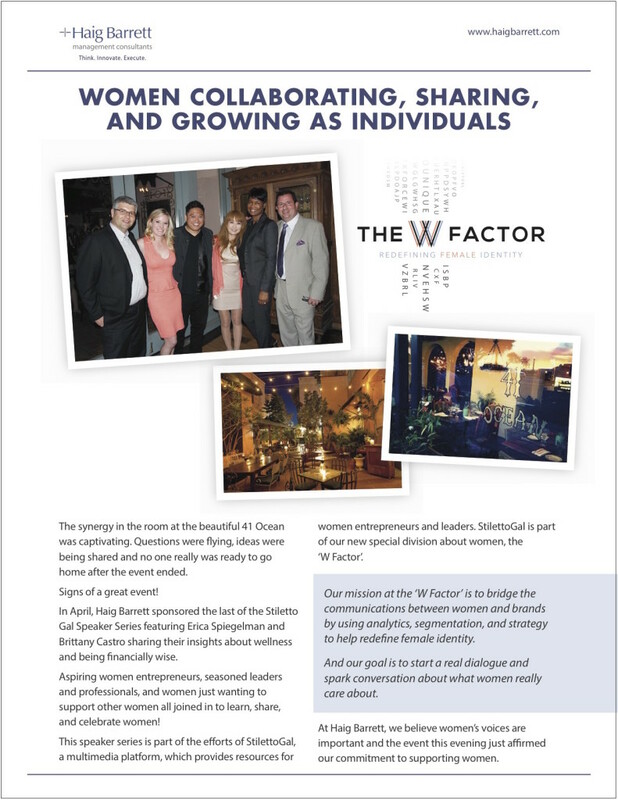 To read more about The W Factor and the Stiletto Gal event in April, click here.